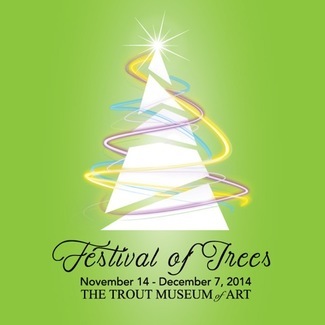 Join the Trout Museum of Art for this free celebratory exhibit! The Fox Cities Building for the Arts rings in the holiday season with unique experiences for the entire family. Local artists and businesses display colorful wreaths, trees, and stockings, available for silent bidding throughout downtown Appleton. When planning your visit to the museum, please be aware that the elevator is currently out of service. We apologize for the inconvenience. For a full Festival of Trees experience, be sure to visit each participating downtown destination. Each business is part of the exhibition space, showcasing a tree that you can bid on. 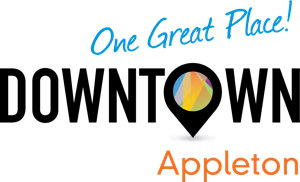 Proceeds benefit a partnering non-profit organization. Pick up a map at The Trout Museum of Art to participate in this downtown experience! 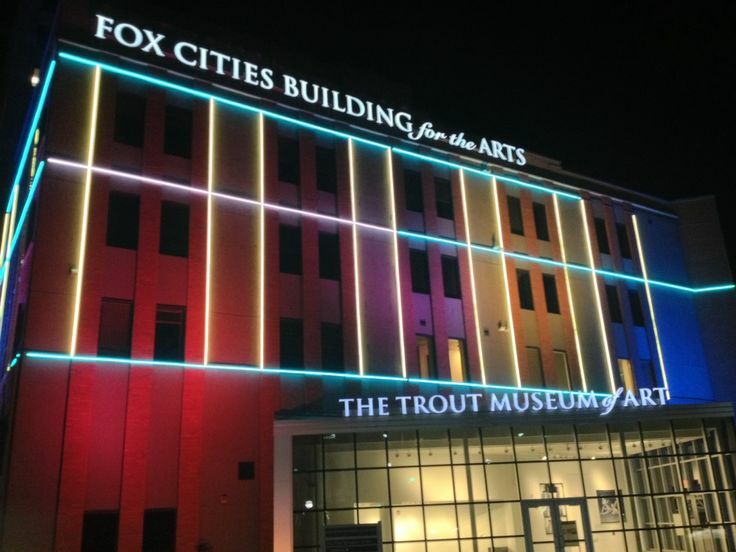 The Trout Museum of Art will extend its hours starting Thursday. It will be open from 10 a.m. to 8 p.m. on Thursdays to coincide with efforts to engage community members with downtown Appleton’s art, music and food scene. The museum’s extended hours will give patrons extra time to visit the Norman Rockwell: A Portrait of America exhibit, the Regional Artist Gallery featuring Richard Margolis, and the newly revealed American flag community art project created at the 55th Annual Art at the Park. 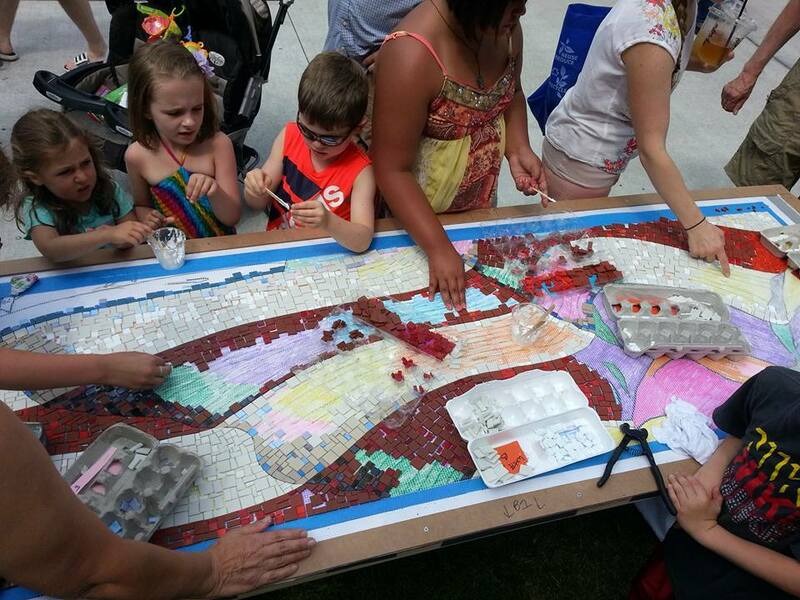 Led by local artist Kim Schonfeld, the five-foot by seven-foot mosaic was created out of 20,000 pieces of unglazed porcelain Sicis tiles from Italy and ceramic tiles from France by hundreds of community members attending three Appleton Downtown Farm Markets and Art at the Park. Schonfeld and the newly minted local artisans were assisted by many community partners, with sponsorship of the collaborative project coming from Bergstrom Automotive. For more information, visit www.troutmuseum.org/Events/Upcoming-Events or call 920-733-4089. 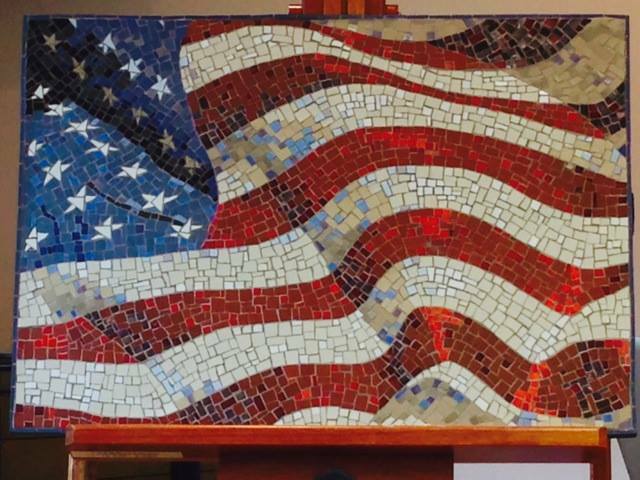 Place your piece on the Trout Museum of Art’s community art project – an American flag mosaic masterpiece! Stop by the Downtown Appleton Farm Market THIS Saturday to help out, then drop-by Family Studio at the Fox Cities Building for the Arts from 9:30am-1pm to create your own mini mosaic to take home! $5/person. Thank you to artist, Kimberly Schoenfeld for spearheading this piece as well as project sponsor Bergstrom Automotive and AATP title sponsor, Community First Credit Union for making this possible. FREE Admission to spectacular exhibits at the Fox Cities Building for the Arts for Art on the Town! Travel back to the early 20th century through the family ‘Photography of Loretta Judson’. Also, this weekend is the last chance to see the 35th Annual SECURA Fine Art Exhibition – Northeast Wisconsin’s Premier Juried Art Show. Do you have favorite holiday traditions – making cookies, decorating the tree, going to the parade? 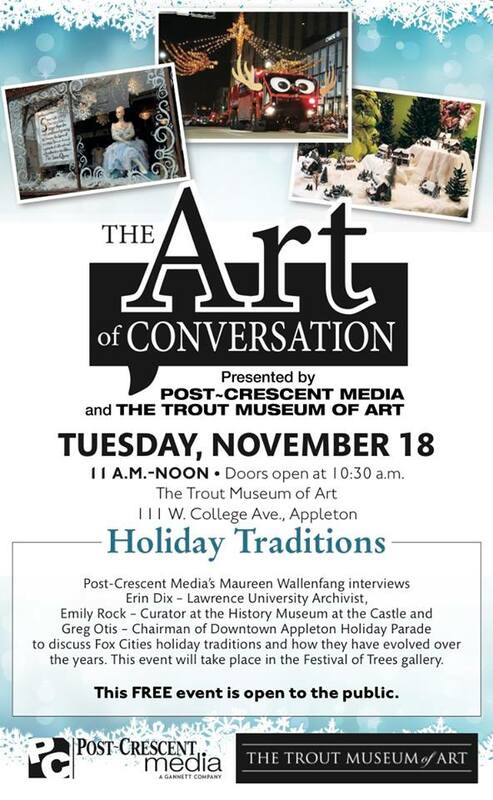 Enjoy a time to discuss holiday traditions with the community at The Art of Conversation at The Trout Museum of Art – presented by The Post-Crescent (Appleton-Fox Cities, Wisconsin), next Tuesday, November 18, 11:00am-Noon in the gallery.